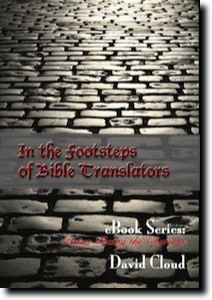 "The Illustrated History of the Bible Translators"
This book follows in the exciting footsteps of Bible writers and translators across Great Britain and Europe. It is the result of firsthand research into the history of ancient Bibles such as the Waldensian, the Wycliffe, the Tyndale, the King James, and the Luther German. Look over the author’s shoulder as he examines this history at Trinity College, Dublin, and Cambridge University Library to view two of the seven surviving copies of the ancient Waldensian New Testament; Lollard’s Tower, where Bible-believing Christians were imprisoned; Lutterworth, where John Wycliffe translated the first English Bible and where his bones were burned after his death; Little Sodbury Manor, where William Tyndale lived; Fulham Palace, where Tyndale tried unsuccessfully to get permission from ecclesiastical authorities to translate the English Bible; St. Dunstan’s in the West, where Tyndale preached before he went overseas; St. Paul’s Cross, where Bibles were burned in England; Smithfield, where Bible believers were burned; St. Magnus the Martyr Church, where translator Miles Coverdale is buried. Visit Vilvoorde, Belgium, where William Tyndale was martyred; the Erasmus Museum, Brussels, where Erasmus worked on the third edition of his Greek New Testament; the Gutenberg Museum in Mainz, German, which houses many copies of the ancient Gutenberg Bible as well as fascinating displays pertaining to the history of writing and printing; the Crime Museum, Rothenburg, Germany, with its massive collection of artifacts about law and crime in Europe dating back to the 12th century, including instruments of torture that were used by the Roman Catholic Church; Zurich, where Zwingli led in the Protestant Reformation and where Baptists were drowned by the Protestants; Piedmont, Italy, where the Waldensians held the New Testament faith in their mountain strongholds and suffered greatly for resisting Rome’s authority; and Rome itself, where portions of the New Testament were written and where the false “church” attempted to keep the Bible out of the hands of the common people. This is history that every child of God will appreciate. Illustrated with 94 pictures taken on location of the places described above.